Cue hearts sinking all over the ship. But our man of the sea had a plan. A grand one. We’d weigh anchor and set sail for our next destination: San Juan, Puerto Rico. If we left now and sailed through the night, we’d get six extra hours in the U.S. commonwealth’s capital and have more than enough time really get to know the city. Cue applause all over the ship. 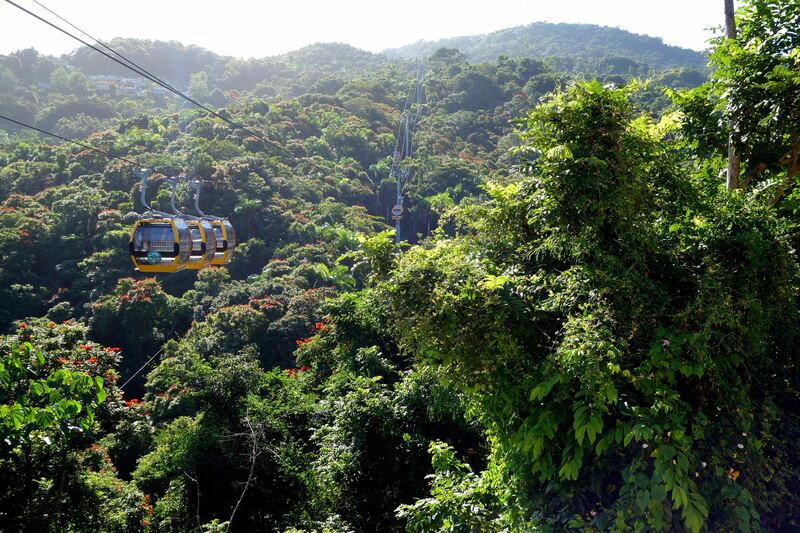 Skybuckets coast high above the rainforest canopy of La Marquesa National Park. The next morning, we awoke to still waters in the San Juan harbor. With the additional time here, new excursions were added to the morning itinerary. 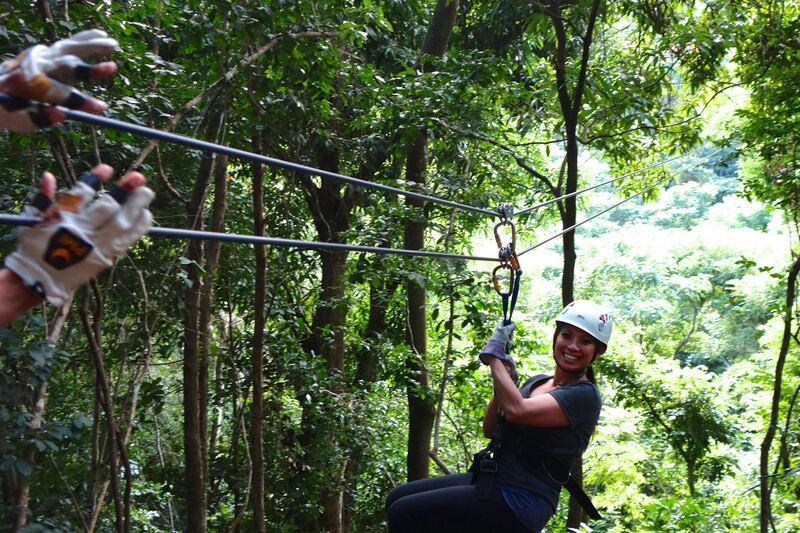 And because all these excursions were free (included) on the Regent Seven Seas Navigator, our family decided to move our La Marquesa National Park Canopy tour to 9am, freeing up our afternoon to do an in-depth exploration of the town. 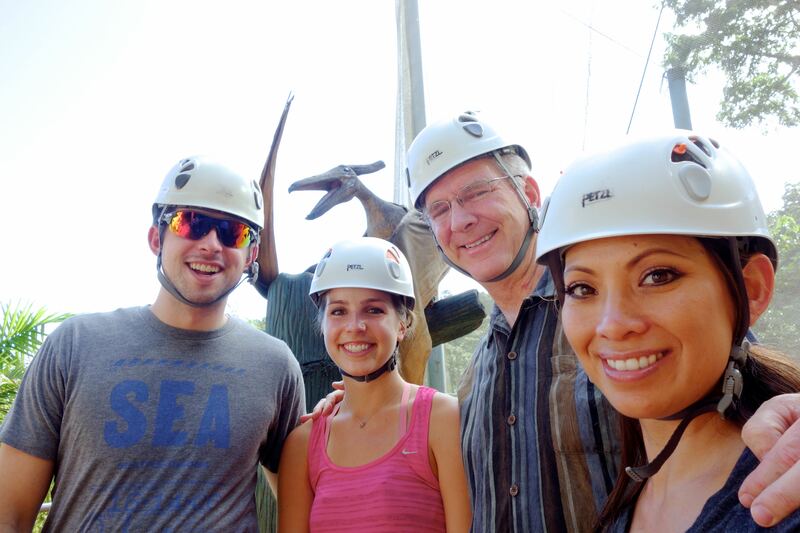 Andy, Jackie, Rick, and I (and a pterodactyl) are ready for our Puerto Rico zipline adventure. 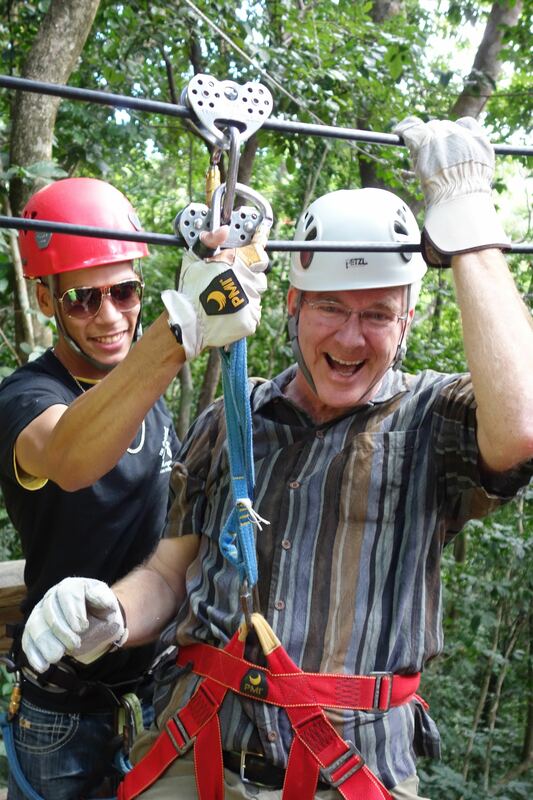 Rick is an old pro at ziplining and is all smiles. 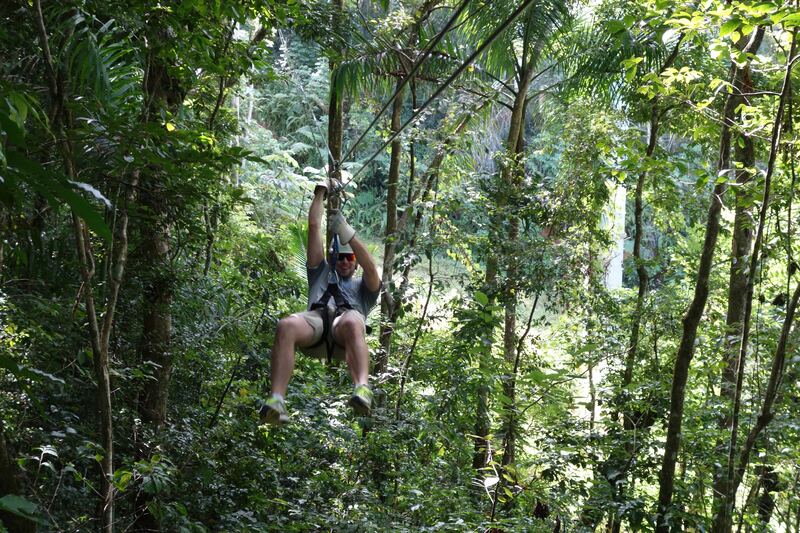 While Rick, Andy, and Jackie had done this kind of treetop adventure before in Costa Rica, I was the neophyte, wide-eyed and nervous about sliding from one trunk to the next on what looked like black garden hoses. Already feeling awkward with a harness wedgie, a cracked helmet, and tattered gloves that were one size too small, I listened intently to our native Puerto Rican instructor as she explained what to do in her thick, boriqua-accented English. Let the guides clip you in, sit down, hand behind the clasp, don’t grip the tube too early or you’ll stall your momentum, slide your hand back if you swivel, press down on the tube when they tell you or you’ll slam into the tree. Oh, God, I’m going to end up with a concussion. Andy, The Brave, shows us how it’s done. Jackie makes it look so easy. 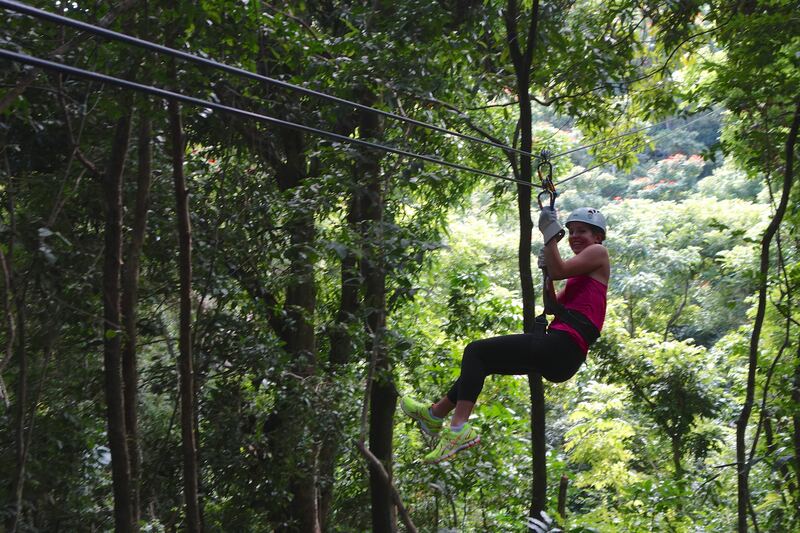 I love this ziplining thing, and I can’t wait to do it again! More adventures lie ahead in San Juan. Stay tuned for the next post to learn about the rest of our experiences in Puerto Rico’s capital. How much fun! Looking forward to hearing about the food and drink on your cruise too! Thanks, Barbara! It really was a blast, and I’m eager to share our adventures with all my Travelphilers!